Two days ago, my wife and I celebrated our 15th year wedding anniversary and a very dear friend of mine expressed how amazing it was that in these times, how rare it was to be in a relationship of any significant amout of time. She then ask me if I would one day talk about how we made it, while balancing both of our demanding careers. First and foremost, I'm not my any means an expert when it comes to relationships. What I do know, is that based on my personal experience, relationships require time, commitment, and the willness to being honest and open to your partner as well as yourself.... ALL DAY, EVERYDAY!! Looking back, I used to look at relationships the same way I used to value life in general. Wow, was that a big mistake. I constantly created a life filled with headaches and heartaches. I was simply initiating relationships based solely on a "want". Just because I was watching others around mingling and giving the appearance of having such a wonderful and exciting time together, didn't necessarily equate to long term or that life of forever after effect you read about in story books. Of course, I'm not saying that everyone of my, "want" relationships resulted in disaster, but there usually was no tenure experienced and that was because, not long after I "fell" in love, I quickly "fell" out of love. Uummm, I wonder has this ever happen to you and your relationships too? The key is "growing" in love. The goal is "growing in love together". The result..."PRICELESS". Anyway, while coming up through the years, I've learned a lot about what I "want" compared to what I really "need". What I did was honestly, evaluate each of these factors and the sum of which, put me on the right course. Careers are great to have, but they can also be a hazzard to a relationship if YOU allow them to. Think about it, when was the last time on a cold and dark lonely night, and you're watching this incredible movie or listening to your favorite Barry White tune, and suddenly the thought of sharing this moment of hot and steamy passion with someone.... you picked up the phone and called your selfish, demanding, stressful career, to come over and extinquish your flames? Ummm, again! Additionally, sharing with one another is also essential. Most, excessive career minded individuals tend to really separate their personal life from their professional life. I feel that once you both start separating some of the things in your relationship, it creates an avenue of acceptance to separate not only other things but everything. To each his or her own, but some people take this process literally; they separate money, cars, children, the house, the food, the bed, the dog and eventually each other. This mindset, I believe sacrifices the partnership... the core of the relationship. Careers were invented by man, not by the higher source that I associate with, who like himself is everlasting and loves unconditionally. Let me just say, that in my book, the latter should be the pattern of our love to one another. So, if your one and only, secret and true love is your career..., you have my heartfelt sympathy. Like this post title states, "For your precious love, means more to me, than any love could ever be". Actually dad, today happens to be Fathers Day and everything you've instilled in me has been manifested into my present reality. For you see dad, I'm now also a father and amazingly, as I daily behold the man in my mirror and gaze upon the faces of my sons.... You're there. Well Dad, its been 25 years since you've been gone, resting in that place so bright and fair; where there's no more sickness and death. Enjoy forever the peace and eternal love that was promised. Thanks Dad, and by the way....I will never forget. **This post is a repost of the original, "The Winter Will Come". There are minimal additions to the original content which reflects my endless love to my father's extraordinary life and memory. Seven years ago, in the fall of 2003, I turned the eager and energetic age of 50. Wow, I had hit the top of the hill according to a few of my closest friends. Soooo.... what are you going to do different they ask? Of course I was still caught up in the fact that I was blessed to even see 50 years of life, especially with practically everything from all my physical and mental aspects in tact. After several minutes of beinng in my own little world, the voices around began to get louder and more direct. I guess I spaced out a little. I only remember saying yes I can and yes I will! After high fiving everyone, I discovered that I had agreed to enter a local bodybuilding contest. 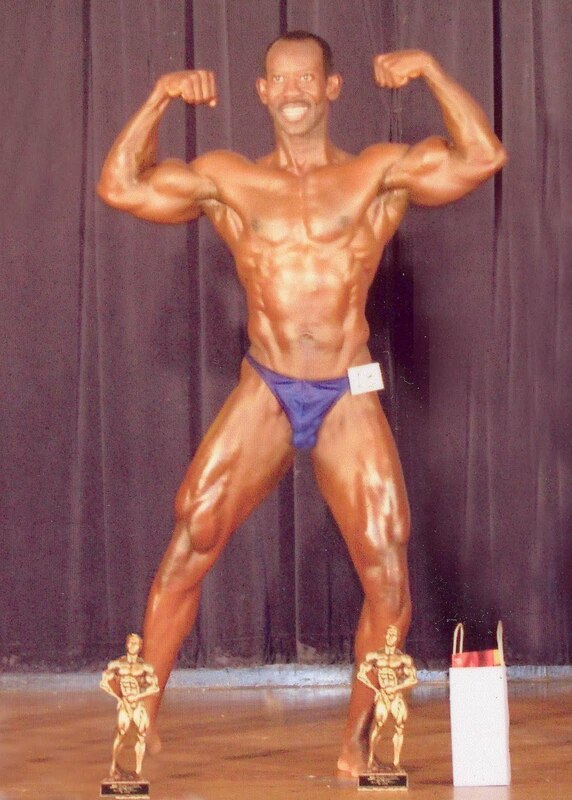 Anyway, through all the 24 weeks of training and grueling dieting regimine, I guess I shocked some of those doubting friends, when I delivered a FIRST PLACE trophy in the masters division. Since that time, I started to seriouly train again, only this time just to duplicate and or simulate that bodybuilders look, without the stresses of actually doing the show. My problem this time is that, I'm seven years older and believe it or not, I'm convinced that things really do change. This old body constantly reminds me that I need to make new mental and physical adjustments. Interestingly enough life is, has and can have a strange sense of humor. It also has the tendency to every once in awhile.. throw you a curve ball. My curve ball came fast and hard. Initially, I took a mighty swing at it, but I really should have ducked. There it was flying toward me as if it was shot out of a cannon. The final result of the umpire's (surgeons) call was... A HERNIATED DISK. No way, I said. Yes it is, he replied. It's now been seven to eight months of every pain pill the doctors could prescribe. Then came the echoing advise of trying acupunture; chiropractic; deep tissue massages; decompression therapy; hot and cold compresses; crutches; limping and finally, "Why don't you just stay in bed"! Last resort.. SURGERY. YIPES!! AGAIN. Through it all, thanks to my strong faith in sincere prayer. Everything turned out just fine. The hills of life are still present and will be for as long as we are alive and breathe air. A positive mindset and the willingness to forge forward and never give up is vital to a positive outcome. Here's what I thought of most and I truly hope that this statement will help you when you're standing at the plate of life's challenges and the next pitch you're thrown is a curve ball. When God leads you to the edge of the cliff, trust him fully and let go, only 1 of 2 things will happen; either he'll catch you when you fall, or.. he'll teach you how to fly!